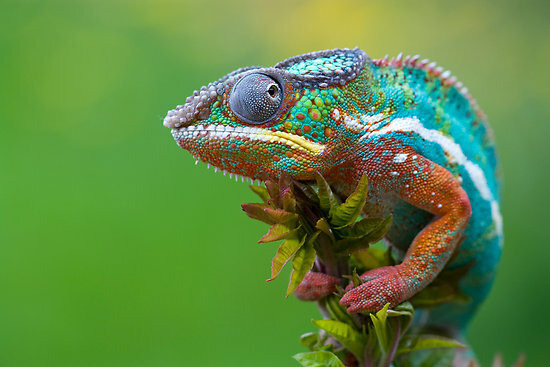 The Panther Chameleon is a species of brightly colorful chameleons that are indigenous in the tropical forest areas of the Republic of Madagascar. These rainbow-colored lizards are very common in the pet trade, and their popularity mostly lies in their outstanding pied, dappled skin. 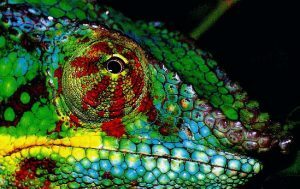 The creatures change color like the other chameleons would, however in a much spectacular way. Though, the hues and tones of the geographically isolated populations tremendously differ from each other, depending upon their sub-locales. Size: The males are larger and can reach about 17 inches in length. Some specimens have been seen to be reaching up to 22 inches. Females are a little smaller at 10 to 14 inches. Weight: Males weigh between 140 and 180 grams, while the females are generally between 60 and 100. Skin: Males have more vibrant colors than the females. They appear in shades and degrees of brilliant blues and greens, and sometimes black, bearing bright patches of yellow, pink, orange and red. 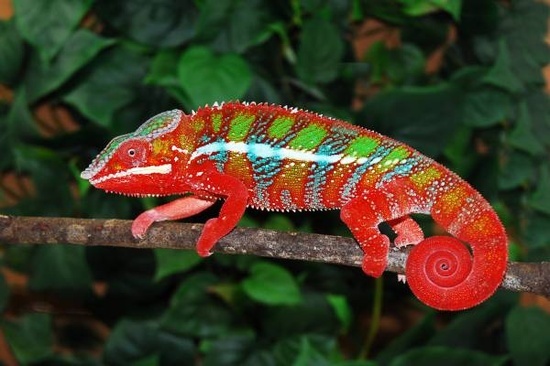 Vertical bars of reds and blues on the body and yellow-mouth chameleons are also not uncommon. Feet: 5 toes fused together to two groups of two and three fingers that have given their feet an appearance of tongs. The group of two is on the outside, while the group of three on the inside. Eyes: Eyes are conical in shape that can rotate freely. Each of the eyes can focus separately on two different objects. Nose: Two small nostrils above their mouth like most other chameleon species. They have white mucus around their nose. 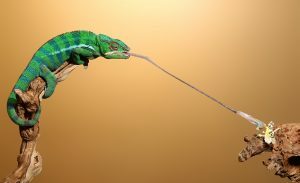 Tail: Moderately long and flexible tail that the chameleon can curl according to its needs. 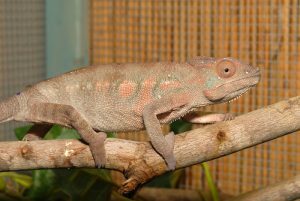 Sexual Dimorphism: The male Panther Chameleons bear small ridges that protrude from their head. The Panther Chameleons can live up to 5 years. Though, in captivity, some specimens have been seen to be living for up to 7 years as well. Males usually outlive the females. 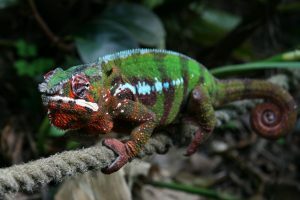 Though the Panther Chameleons are native and endemic to the island of Madagascar (close to Africa), the species has been introduced to the main island of Mauritius and the adjacent Réunion. 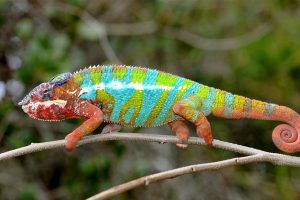 In Madagascar, they are mostly found in the lowland areas of the east and the northeast, ranging from 80 m to 950 m above sea-level, though less common above 700 m.
The panther chameleons are found much closer to the forest floor than many other chameleons. They commonly dwell in the foliage of small trees in the areas covered by tropical forests. These reptiles are tree dwellers and are diurnal. They forage from branches of plants to big bushes, and hunt for their prey. They are extremely territorial. They spend most of their lifetime all alone in their territory. However, it is only during the mating season that they spend time with their partners. When two male chameleons would come face to face, they become aggressive, change their colors and inflate their bodies to appear larger as a territorial display. The combat usually ends at this stage with the loser backing up and leaving changing its color to a dark or drab shade. However, if the clash doesn’t end, it would lead to a physical fight. Some experts debate that, in captivity, the two genders of these solitary creatures would never live together peacefully, in the sense that, the female would starve to death even being in sight of a male. However, two females can safely be kept together, and babies and young ones can live together with other individuals of their same age. Their color changes have diversified meanings, with color yellow showing anger or aggression, cyan/blue indicating the individuals wish to impress another. Green color signifies a calm and relaxed attitude, and lighter colors signal its intention to mate. A gravid female (carrying eggs) is reluctant to mate would turn itself brown or black with stripes of orange. 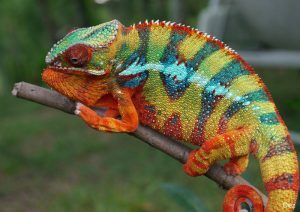 The female panther chameleons can lay five to eight clutches of eggs in her whole lifetime, after which it dies within two to three years. These animals are polygamous. The breeding period is between the months of January and May. When the male chameleons want to mate, they bob their heads up and down, and from side to side. 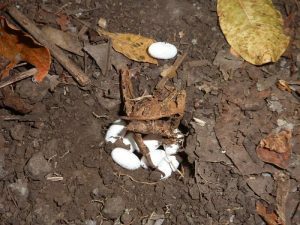 Each clutch consists of 10 and 40 eggs, which normally depends on the food intake and the subsequent nutrition the female could consume during her gestation period of 3 to 6 weeks. The hatchlings come out typically in 240 days after incubation. A baby panther chameleon would take a minimum of seven months to attain the ability of reproduction. Depending upon their range, the panther chameleons will primarily eat diverse type of worms that are available in the wild, as also insects like crickets, grasshoppers, roaches, etc. The body colors of these creatures vary greatly from one another, with the males having all the colors of the rainbow, while the females usually turn dark brown and gray. The head of this insectivore has a hard helmet, thus protecting it. The eyes of these lizards extend out of their head, and hence, for protecting them, they are covered with scaly skin. Their main defense mechanism is visual clues, with both the eyes being able to turn on their own in different directions, and at the same time. The long, sticky tongue (very similar to that of a frog) is specially adapted helping them catch their prey easily. Chameleons are at the bottom of the food chain. Snakes, birds such as shrikes, coucals, and horn-bills, and sometimes, even monkeys would also prey upon the panther chameleons. 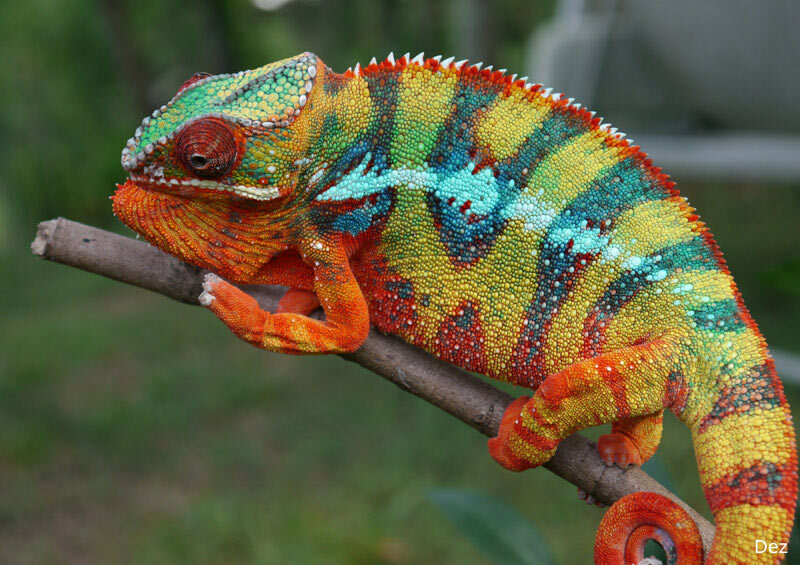 These chameleons are not endangered. The IUCN 3.1 has categorized the panther chameleon under the LC (‘Least Concerned’) species list. Before owning these creatures from the wild or adopting them from the breeders and keeping them as pets, one must remember that this chameleon is a pet that is more for observation rather than handling. However, the temperament of these pets varies. While some would tolerate frequent handling in a friendly manner, others might not accept so and end up biting. 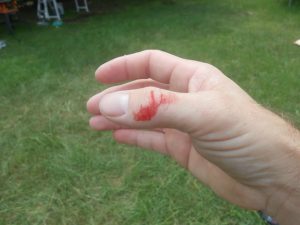 Though its bite is no more than an aggression, and normally it does not hurt. 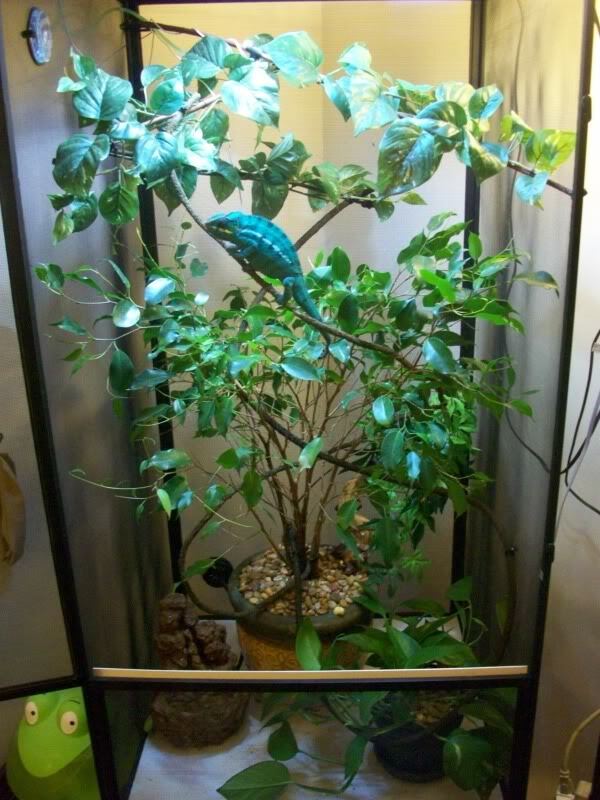 Cage Setup: You can either use an aluminum screen cage, which is ideal to house reptiles like chameleons, or else, a reptarium or a glass terrarium of appropriate size, depending upon your pet’s age. 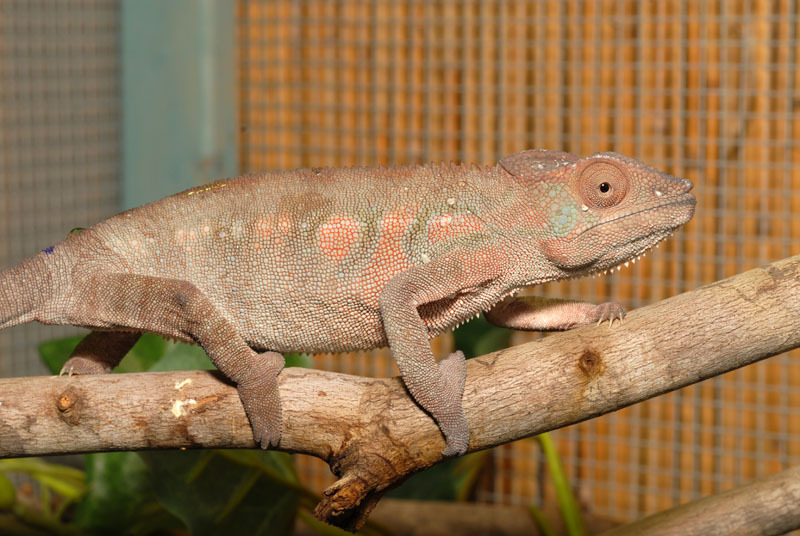 Adult panther chameleons need a cage that is at least 24” x 24” x 36”, but bigger the better. However, the juveniles do well in smaller cages. You can also make a large size outdoor reptarium for your pet for days with good weather. Lighting: Since they love basking, the temperature inside their cages should be optimum. Traditionally, it is recommended that you use a UVB light setup, which is a strip light, having a 5.0 ZooMed Reptisun bulb inside. Use this setup in addition to a regular basking bulb, since the basking bulbs do not emit any UVB. If your cage is big enough for heat to dissipate, use a mercury vapor bulb, which would be the common source of both heat and UVB. Humidity: In order to keep optimum humidity, mist the lizard two to three times a day. This will maintain the humidity in the required range of 60% to 70%. Plant lots of greens around your cage (though you can also use artificial ones) since this will keep the inside of the cage hydrated. Feeding: Cricket is the staple diet of these creatures. Supply your pet with ample of these insects alongside stick bugs, roaches, superworms, waxworms, silkworms, hornworms, etc. 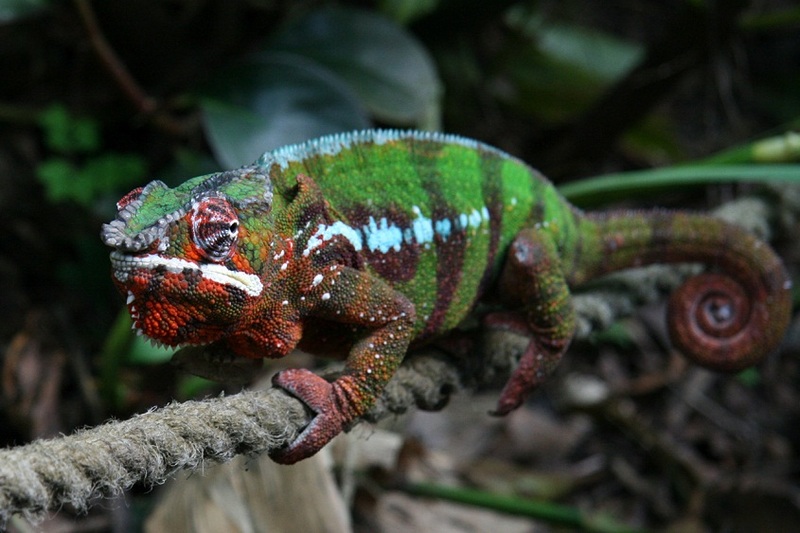 Some panther chameleons eat fruits and vegetables; some do not. However, experts say that, eating too much fruit might not be good for the digestive system of these insectivores. 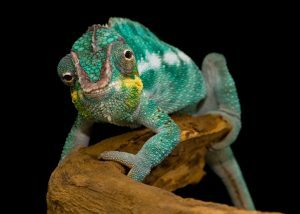 Also, dust your chameleon with vitamin powders and calcium thrice a week, calcium with D3 once a week, and Herptavite once fortnightly. Drinking: These animals love to drink, and they need it. Hence, this is one of the most important things to consider while adopting one. 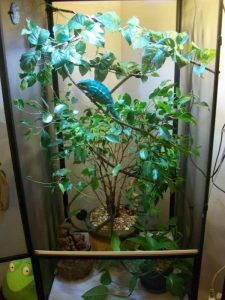 You can install a water dripping system inside the cage so that the chameleon can take in full drops, whenever it wants. 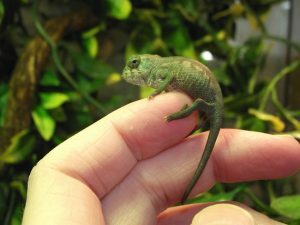 Illnesses: Like most other chameleons, they are also vulnerable to common ailments like stress, eye infections, upper respiratory tract infections, parasites, kidney failure, gout, metabolic bone disease, etc. They are called ‘panther’ because they are very aggressive. Gaping (opening the mouth wide) is a part of their normal activities. These chameleons might often yawn like humans, especially in the morning. Though a male would often be aggressive to and fight with other males, they would run and hide when attacked by humans or predators. When threatened, furious or angry, they might emit a hissing sound. Some individuals might snore during sleep. My Panther will come running to me when we come open the cage. He is super mellow and easy to handle. 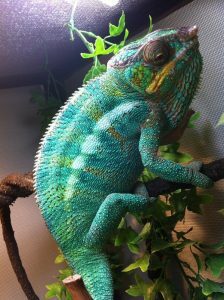 I have had a male Jackson in the past who was also very mellow and easy. The female veiled was not!